The first aim of this chapter is to briefly review some of the set families used in control and to comment on the strengths and weaknesses of each of them. The tools of choice throughout the manuscript will be ellipsoidal and polyhedral sets due to their combination of numerical applicability and flexibility in the representation of generic convex sets. After the geometrical nomenclature, the concept of robustly invariant and robustly controlled invariant sets are introduced. Some algorithms are proposed for computing such sets. 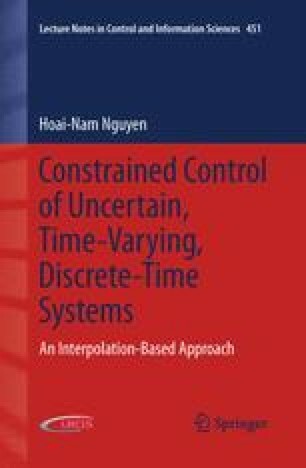 The chapter ends with the problem of estimating the domain of attraction for uncertain and/or time-varying linear discrete-time systems with saturated input.